Protists are a heterogeneous group of living organisms, comprising those eukaryotes that are not animals, plants, or fungi. In systems of biological classification, they usually are treated as the Kingdom Protista or Protoctista. Protists are more complex than bacteria in that they have cell nuclei, but less complex than fungi, plants, and animals because they are mostly single-celled, or if multi-celled, they lack highly specialized tissues. The protists are a paraphyletic grade, rather than a natural (monophyletic) group, and do not have much in common besides a relatively simple organization. Some call it the "left-overs" from the other eukaryotic kingdoms. Protists are a vital part of the earth's ecosystems and are particularly noteworthy because they make up the largest part of the plankton on which almost all life in the oceans depends. In several ways, protists reveal an astonishing harmony and unity in creation. Small, photosynthetic plankton use carbon dioxide and produce oxygen—indeed most of the world's oxygen—while other organisms consume the oxygen and produce carbon dioxide. The phytoplanton capture the sun's energy, and serve as food and energy for organisms on higher tropic levels, and, to make the circle complete, serve as decomposers in breaking down dead plant and animal material so it can be reused. Many protists, particularly algae, are involved with other organisms in symbiotic relationships of mutual benefit (mutualism). On the other hand, protists are also the cause of many diseases affecting both people and the cultivated plants we depend on for food. For some human diseases, there are associated lessons of personal and social responsibility. In the case of malaria (caused by a protozoan), individuals have access to mosquito nets and vaccines, and those with means have a moral obligation to help those who cannot afford such life-saving measures. In the five-kingdom taxonomic scheme developed by Robert Whittaker in 1969, protists are one of five kingdoms: Monera (prokaryotes—bacteria and blue-green algae), Protista (unicellular, multicellular, and colonial protists), Fungi, Plantae, and Animalia. This system remains popular today. Likewise, protists are a kingdom in the six-kingdom taxonomic scheme, with the addition of Archaebacteria as a sixth kingdom. In the three-domain system of Carl Woese, protists are a kingdom under the top level grouping of Eukaryota. At one time, bacteria were also considered protists, under the three-kingdom system of Animalia (corresponding closely to the modern kingdom), Plantae (which included Fungi as well as plants), and Protista (everything else). However, most current systems of classification treat bacteria separately. For the last 150 years, protists were subdivided into several groups based on similarities to the higher kingdoms: the plant-like algae, the animal-like protozoa, and the fungi-like slime molds and water molds. These groups often overlap, and have been replaced by phylogenetic classifications. However, they are still useful as informal groups for describing the morphology and ecology of protists. The green and red algae, along with a small group called the glaucophytes, appear to be close relatives of other plants, and so some authors treat them as Plantae despite their simple organization. Most other types of algae, however, developed separately. They include the haptophytes, cryptomonads, dinoflagellates, euglenids, and chlorarachniophytes, all of which have also been considered protozoans. 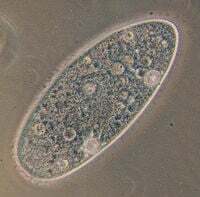 Some protozoa host endosymbiotic algae, as in Paramecium bursaria or radiolarians, that provide them with energy but are not integrated into the cell. 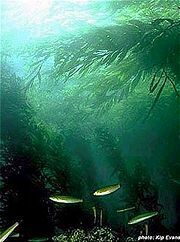 Algae are found in many environments both in water and on land. They are most important as, along with cyanobacteria, a part of the phytoplankton in the world's oceans. Phytoplankton are the foundational energy level of almost all marine life. Some algae exist in symbiotic relationships with other organisms. Lichens are a partnership of fungi and algae. Some corals, sponges, and jellyfish host algae which provide them with food and in return receive protection. Algae also live in the hair of sloths in South American rain forests. This relationship provides the algae with a home and the sloth with a green color for camouflage. Seaweeds are multi-cellular algae. Although they can grow very large, they lack the complex structure of plants. The largest seaweed (and the largest protist) is the giant kelp, Macrocystis pyrifera, found along the Pacific coast of North and South America. It can grow to a length of 60 meters (200 feet). Some seaweeds are harvested by humans for food and other uses. Some protozoa are an important part of marine plankton as consumers of algae and other plant-like phytoplankton and as food for marine animals. They are also important as decomposers in land environments as well as in the ocean. Others are parasites of plants and animals. Protozoa are the cause of many human diseases. The most serious is malaria, which is caused by four species of the genus Plasmodium, protozoa whose life cycle makes them in turn parasites of both humans and mosquitoes. Malaria kills over one million people a year, most of them African children. Other diseases caused by protozoa include: African sleeping sickness, amoebic dysentery, chagas' disease, giardiasis, leishmaniasis, primary amoebic meningoencephalitis (PAM), and vaginitis. Various organisms with a protist-level organization were originally treated as fungi, because they produce sporangia, structures producing and containing spores. These include chytrids, slime molds, water molds, and Labyrinthulomycetes. Chytrids can be single or multi-cellular. There are about one thousand species, most living in water or soil. Most are decomposers. Some are parasites and can cause diseases in plants, including corn, alfalfa, and potatoes. One species, Batrachochytrium dendrobatidis, seems to be the cause of Chytridiomycosis, a disease of frogs that is seriously affecting many wild frog populations around the world. Slime mold on lawn, U.S.A. Trail of movement can be seen. Slime molds are notable for their unusual life cycle. In some species, individual single-celled organisms come together and fuse to form a giant cell with thousands of nuclei. This body, called a plasmodium, can move around consuming bacteria, fungi, and decaying plant matter. (This is a different usage of the word plasmoidium from that used above for the genus of parasitic protozoa.) Slime molds are found worldwide. Water molds thrive in water and wet soil. They are considered to be more closely related to plants than fungi since they have cellulose cell walls. They are single-celled. Many are parasites and can cause diseases in plants, fungi, and animals. One species Phytophthora infestans causes the potato blight, which led to the Irish potato famine. Labyrinthulomycetes form a network of tubes or filaments over which the single cell organisms slide to gather food. They are mostly marine and are decomposers of dead plant material or parasites on plants and algae or some animals. The classification of protists is still changing. Newer classifications attempt to present monophyletic groups based on ultrastructure, biochemistry, and genetics. A monophyletic group consists of a common ancestor and all its descendants, whereas a taxonomic group that contains some but not all descendants of the most recent common ancestor is called paraphyletic. Because the protists as a whole are paraphyletic, such systems often split up or abandon the kingdom, instead treating the protist groups as separate lines of eukaryotes. The scheme by Adl et al. (2005) is an example that does not bother with ranks (phylum, class, etc.). Cavalier-Smith, T. 2003. “Protist phylogeny and the high-level classification of Protozoa.” European Journal of Protistology 39:338-348. Lipscomb, D. 2006. “Protozoa” (accessed July 15, 2006). This page was last modified on 21 February 2017, at 23:22.